Submitted by Chui-Ling Tam on November 17, 2017. I see suits. After 11 days and 25 side events, visions of a sea of men in dark suits and short back and sides are swimming before my eyes. Even as I sit at the Indonesia pavilion facing the palm trees and thatch huts of the Fiji pavilion, with men in batik shirts and women with frangipani-adorned hair strolling past me, the overwhelming impression is of men in suits. It’s not just me. Mary Robinson remarked on it too. The past Irish president and past UN Commissioner for Human Rights, now busy with the Mary Robinson Foundation – Climate Justice, declared during a Climate Action Studio interview that it was nice to see women outnumber the men for a change. Robinson was one of four speakers, two men and two women, but the gender re-balance occurred courtesy of the 15-year-old girl conducting the interview. A few days earlier, the equally eloquent Anote Tong, former president of Kiribati and tireless climate warrior, told a worshipful room that Kiribati would disappear, but its people had plenty of time if we work on pre-emptive responses and training to prepare them for eventual climate-induced migration. The Kiribati diaspora would shine in new worlds, he said, and then he singled out a female compatriot and declared there was nothing to stop a beautiful Kiribati woman from becoming the prime minister of Australia. Submitted by Chui-Ling Tam on November 15, 2017. One of the most remarkable innovations at COP23 Fiji has been its Talanoa Space in the Bonn zone. It features a huge wall of green foliage and red, white and pink flowers, a vibrant shock of tropical colour amid the cool white tones that permeate the spaces of COP. Speakers are seated in rotund wicker chairs, facing a tiered amphitheatre dotted with floor mats where audience members can comfortably sit cross-legged. The Talanoa Space includes smaller intimate spaces with more relaxed seating, where the occasional musician might start strumming a guitar amid the passing crowd of badge-wearing delegates. Submitted by Matthew Nisbet on January 12, 2017. 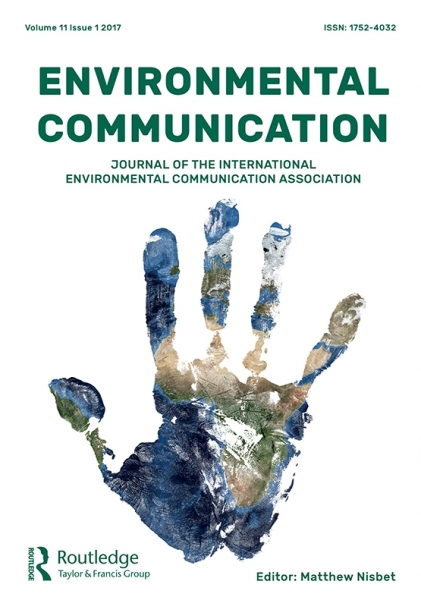 The first 2017 edition of Environmental Communication is now available, marking the inaugural issue of my term as Editor-in-Chief. Featuring a new cover design and article layout, the issue is headlined by studies authored by Kathleen Hall Jamieson and collaborators at the Annenberg Public Policy Center; by Robert M. Perkowitz and colleagues at ecoAmerica; by James T. Spartz, Dominique Brossard and others at the University of Wisconsin-Madison; by Bruno Takahashi and colleagues at Michigan State University; and by Edna Einsiedel and collaborators at the University of Calgary. Go to the issue full line up of studies and articles. Over the past few months, we have added several top scholars and experts to our Associate Editor team including Shirley Ho (Nanyang Technological University, Singapore), Jonathon Schuldt (Cornell University), Declan Fahy (Dublin City University, Ireland), and Silje Kristiansen (University of Zurich / Northeastern University). Submitted by Gregg Walker on November 17, 2016. This is my 8th consecutive Conference of the Parties (COP) on climate change. As I have observed the UNFCCC negotiations for the past few years, I have experienced the turmoil of Copenhagen, the salvation at Cancun, the Goundhog Day pace in Doha, and the celebration in Paris. I arrived in Marrakech from Philadelphia, after the US national election and the National Communication Association conference. I wondered how the prospect of a Trump US Presidency would affect work at COP 22. Submitted by Stacey Sowards on November 16, 2016. Today, Giles Dodson and I (along with 500 or so others) listened to US Secretary of State John Kerry talk about climate change at the UNFCCC. Interestingly, we didn't know he was going to be speaking until this morning, but as soon as I saw that he would be talking, I knew I wanted to attend. I never got to see him speak when he was running for president, so it was exciting to see him talk in person. Submitted by Eva Aasen Ekstrand on November 16, 2016. In addition to what Giles wrote about yesterday´s side event, it is worth mentioning the complex bureaucracy that continues to grow after each COP. It is hard work to navigate in the mist of acronyms. Dr. Saleemul Huq called for a more empathetic and human forms of meetings -beyond the acronyms- which can strengthen cooperation and exchange of knowledge and ideas. This side event was a vibrant example of the latter. I hope the discussion will go on. Submitted by Giles Dodson on November 16, 2016. Another focus of discussion at COP22 has been capacity building. Capacity building is explicitly mentioned within several UNFCCC instruments, including several Articles of the Paris Agreement. Article 11 has produced the formation of the Paris Committee on Capacity Building. A stimulating side event yesterday focused on the role of universities within global capacity building. Marrakech is certainly an atmospheric location for COP22 and the old town Medina, the souks, pumping music and motorbikes provide a marked contrast to the highly structured and sedate environment of the COP. Much of the discussion in the UNFCCC events is generally dry and technical, as befits a UN mega-event. The reporting at both the multilateral assessments and Ad Hoc Committee on implementation was as dry as the surrounding Marrakech desert. Submitted by Stacey Sowards on November 15, 2016. Today is gender day at the UN Framework Convention on Climate Change (UNFCCC), COP 22. With that in mind, I would like to share a few thoughts about gender, environmental justice, and connections to climate change. I attended a panel sponsored by the Women and Gender Constituency, which focused on technical, non-technical, and transformative approaches to addressing gender and climate change. Women's leadership in all parts of the world is essential for how we understand and deal with climate change, which is even more on my mind given last week's election in the United States. Submitted by Chui-Ling Tam on November 09, 2016. At COP21 last year, a strained air of defiance and urgency permeated Paris, still reeling from the lethal Nov. 13 terrorist attacks launched by extremist forces under the guise of Islam. COP21 delegates and other visitors arriving in the City of Light a scant two weeks later were greeted by constant reminders of the attacks: impromptu shrines to the victims, police tape across bombed restaurants, the very visible and heavily armed security presence, and banners proclaiming "Je suis en terrasse" as French citizens reclaimed their public spaces. Support IECA--Now More Than Ever!! Submitted by Stephen Depoe on November 09, 2016. IECA is needed, now more than ever. Submitted by Stacey Sowards on November 07, 2016. The IECA board election ends this Friday, November 11. It's an important civic duty not just for our communities, but our organization's health as well. I'll be at the UN Convention on Climate Change next week, so expect to be hearing more from me then. Submitted by Alison Anderson on October 17, 2016. 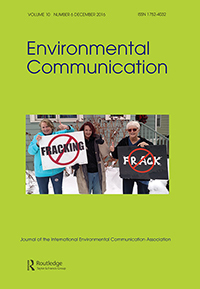 Environmental Communication, Volume 10, Issue 6, December 2016 is now available online on Taylor & Francis Online. Special Issue: Spectacular Environmentalisms: Media, Knowledge and the Framing of Ecological Politics. Submitted by Alison Anderson on October 13, 2016. Angela Smith (University of Sunderland, UK) and Philip Drake (Edge Hill University, UK) authors of "Belligerent broadcasting, male anti-authoritarianism and anti-environmentalism" provide a timely analysis of anti-environmentalism in Top Gear, the hugely popular UK television series. Top Gear is the BBC’s most-watched and most profitable programme, with extensive franchising of both format and associated merchandise. It was, conversely, the BBC’s most controversial show, with repeated official complaints to the broadcasting standards authority (OfCom) and, eventually, widespread media disdain for the main presenter, Jeremy Clarkson. In the end, this all built up to a climactic crisis in late 2015 after Clarkson hit a member of the production team off-camera when filming. Clarkson’s contract had been due for renewal at this point and so, in the face of mounting media pressure, the BBC was left with little choice but to not renew that contract nor that of the two co-presenters, Richard Hammond and James May. A new presenting team emerged, including US actor Mat LeBlanc, German racing driver Sabine Schmitz, F1 racing team owner Eddie Jordan, and lesser-known motoring journalist Chris Harris, and after a public audition, Rory Reid. Headed by TV and radio presenter Chris Evans, the team seemed to represent many of the topics that had been the ‘soft’ target of Clarkson’s Top Gear: race, gender, xenophobia. The show was also split into two sections, with the online TV station BBC3 showing Extra Gear in which Harris and Reid reproduced the more in-depth car reviews and the ‘news’ section that had previously formed part of the main show’s format. The six-episode series that was first broadcast in 2016, with Chris Evans and Matt LeBlanc as lead hosts, was alternatively criticized for being ‘too similar’ to the Clarkson era show, or ‘not at all like’ this. This leads us to the conclusion that there is a certain invisible factor at work in the show that led to its global popularity and widespread derision. - My late husband could always find the good in something. When I would get frustrated and say how I hated something (say, the way the media reported on the environment) he insisted I say five things that I loved. Sometimes it was hard to find five related things that I loved. It made me realize how much we can focus on the negative and it makes us blind to the positive things. Submitted by Stephen Depoe on August 19, 2016. IECA colleagues and others who teach environmental communication: I have now required students in my COMM/EVST 4067 (Environmental Communication) class at the University of Cincinnati to become members of IECA for a couple of semesters. We leverage members-only content, including the membership list, the "EC list" newsletter, and the journal ENVIRONMENTAL COMMUNICATION, throughout the course. This practice also teaches students what it means to join a professional association. The students and I have gained significant value from this required class element at a very reasonable cost to students (currently $76 including journal subscription). Issue 5 of Environmental Communication Out Now! Submitted by Alison Anderson on August 08, 2016. Environmental Communication, Volume 10, Issue 5, October 2016 is now available online on Taylor & Francis Online. Submitted by Alison Anderson on August 05, 2016. As the upcoming presidential election in the U.S. highlights major divides on climate change, Alison Bowers reflects on the challenges and possibilities. The recently-released, annual State of the Climate report, led by the U.S. National Oceanic and Atmospheric Administration and published in the Bulletin of the American Meteorological Society, describes a set of record high temperatures. In 2015, greenhouse gases were at their highest levels on record, as were global surface temperatures, sea surface temperatures, and global sea levels. The report also detailed disturbing changes in the Arctic, a large algal bloom in the Pacific Ocean, continued glacial retreat, and above average tropical cyclone activity. Clearly, climate change continues to be a major global issue demanding decisive and immediate action.